Make a game out of saving money! Each week, select a square. Cross it off. Deposit that amount of money into your savings account. You can go left-to-right, top-to-bottom, get the high dollar amounts out of the way first — it doesn’t matter! 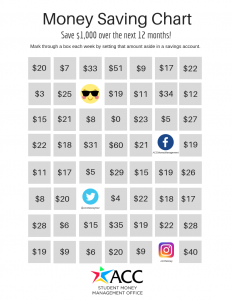 As long as each week you’re selecting a square and putting that money aside you’ll accumulate $1,000 in one year. An electronic version of this chart is accessible via the button above. If you would like to request a hard copy (or a supply to distribute to your class or organization) send your request to money@austincc.edu.